the line bet top prize, Realtime Gaming's new slot called Wu Zetian is full of action and intrigue. Play Wu Zetian on all platforms at Realtime Gaming (RTG) Online Casinos. Immerse yourself in the life and times of the only Chinese female ruler, Wu Zetian, in a brand new mobile slot experience. Admire the beauty and the power of Realtime Gaming's Wu Zetian with crisp symbols, expanding wilds, and numerous ways to win, including a 50,000 bet per line top prize. 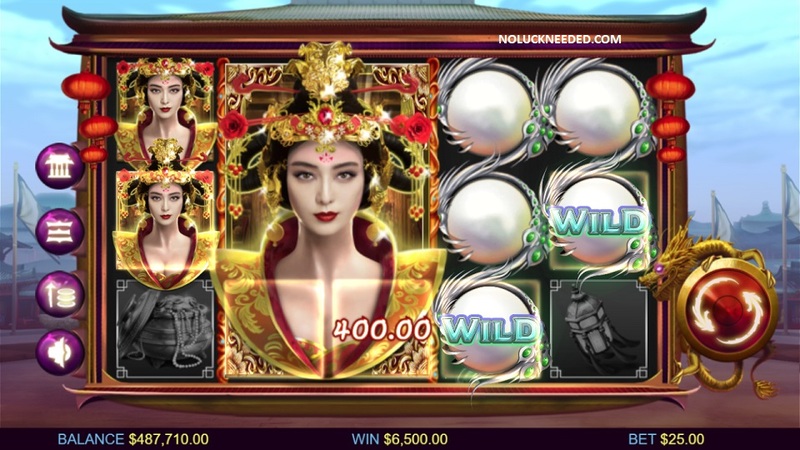 Join the Wu Zetian in a quest for treasure with a new 25 line, 5 reel slot game. Wu Zetian is a generous ruler and by playing her slot she will reward you with riches and free games. Ruling for over 50 years, Wu's reign is known as the Golden Age of the Tang dynasty and the kingdom was very wealthy. When three or more consecutive Gong symbols appear the day switches to night, wilds expand, and you are awarded five free games! Spin the reels of Wu Zetian and test your luck to earn your fortune today! Scatter pays: None - Scatter only acts as Feature trigger. Wild Pearl substitutes for all symbols except for Scatter Gong symbol, and appears only on reels 2, 3, 4, & 5. All symbols, except scatters can appear in the following sizes on multiple reels: 1x1, 3x2, 3x3, 3x4, 3x5. Base game: Either reels 2 & 3 or reels 3 & 4 are connected and spin with 3x2 giant symbols. The Scatter size on this reel(s) is 1x2 but will appear as two adjacent 1x1 symbols. games with 3, 4 or 5 reels connected respectively, during the 5 free games. 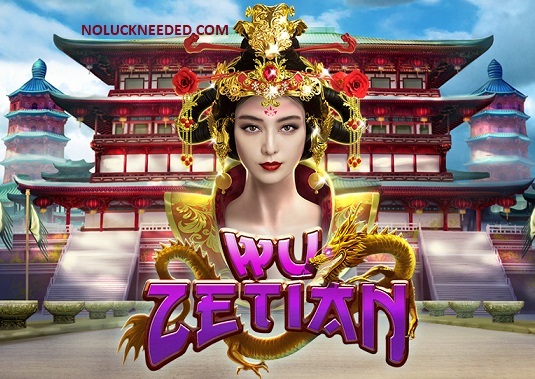 GRANDE VEGAS - DEBUT FREE SPINS FOR NEW SLOT GAME WU ZETIAN. Mzmelabella, Thanks so much! Here are codes for JackpotCapital. $180 Maximum Cashout; Do not claim 2 free bonuses in a row. Standard bonus terms apply. 16 January 2019. 50 x $0.50 Free Spins – Redeem Code: YJBG4 **Plus, you can claim this code twice! Just make a deposit in-between. $150 maximum cashout. Max bet rule applies. P.S. We ask that you make at least one deposit before claiming another free spin code, wager your winnings from the free spins 25x on any game you like before withdrawing up to $150. Expires ? Register your new Kudos account after clicking here, then verify your email address. After verification, redeem the coupon code NLN25 in the casino cashier to claim your free chip or request the bonus from live chat support. 25X wagering, no game restrictions, $150 maximum cashout. Max bet rule applies. Claim Your Wu Zetian Free Spins at Kudos Casino! Thanks to kaska321 for the code! BONUS DESCRIPTION -DEPOSIT $25 GET 100 FREE SPINS ON TOP! BONUS DESCRIPTION - GET 150% MATCH BONUS + 50 SPINS ON TOP! MAX CASHOUT - WIN UP TO $500! BONUS DESCRIPTION - GET 15 FREE SPINS COMPLETELY FREE! MAX CASHOUT - WIN UP TO $200! 100WUZETIAN promo holds 25x roll over. 150WUZETIAN requires a $35 min. deposit and it holds 30x playthrough + 10x roll over on spins winnings. LOYALTYDYNASTY is valid for January 16th and 17th depositing customers and it holds 40x roll over and $500 max cashout. Trial spins are valid until January 23rd. Mzmelabella, You rock! Thank you! Mzmelabella, That's great to hear! I have not tried it yet but hopefully I can soon! Love the look - the colors. Nice game. That's good news. Thanks for sharing a review! Valid for January depositors. General Terms & Conditions apply. The maximum payout is $180. Max bet rule. This bonus is only valid for customers with a deposit in January 2019. Do not claim two free bonuses in a row. This bonus code is valid from January 17th until? I'm playing Wu Zetian and I love it! It is quite unique and reminds me of the new slots in the land casinos. Claim 100 Bonus Spins on Wu Zetian! Play Through 20x Bonus Spin Winnings. shirlsplay, Thanks so much for the code!